Warren East is winding down to retirement later this year from his role of CEO of ARM, but that isn't stopping him waxing lyrical about the impact that the company's big.LITTLE technology will have in 2014. Big.LITTLE pairs a powerful processor with a much smaller one, allowing your device to do intensive processes like gaming using one, but drop down to using the less-power hungry processor when it's doing simpler tasks. Although it made its debut in the much-lauded but little seen octa-core version of the Samsung Galaxy S4, the Korean giant's decision to go with quad core in the major Western markets, including the US and the UK, means that many will have to wait to see its impact. Speaking to us on the day of the company's positive first quarter financial results, TechRadar took the opportunity to ask if he would have liked to have seen the first big.LITTLE offering make it to the UK. "Yes, but we think in due course there will be quite a lot out there," he said. "2013 is just too early to expect to see them in phones. Technology is something that people think of as fast moving and in some ways it is, but it takes a very long time to get products to market. "I'm not surprised that Samsung managed to get a big.LITTLE phone to market this year because they are a very capable, determined outfit and there is a lot of marketing kudos in being first to market. "But the reality is that we have 17 partners with a big.LITTLE licence out there...2014 is going to be a big year." East, who has announced that he will retire from ARM this year, believes that the benefits of utilising a low power processor with a more complex one, upping compute power without sacrifices to battery life is critical. "It is important to get that bit of extra performance to make things that much better," he said. "The Samsung demos showed that, without the big processor, some of the applications can be a bit clunky. The demos are designed to show that and emphasise the point, but it's still a point." ARM's first quarter brought positive results, and the big.LITTLE successes were front and centre in the company's announcement. "Big.LITTLE is ONE of the things that has been a growth driver but I wouldn't say that without it you wouldn't be seeing growth from us," added East. "The requirement for compute performance is going to to increase by a factor of 30 in the next decade but battery size capability doesn't increase at anything like that - maybe a factor of two." 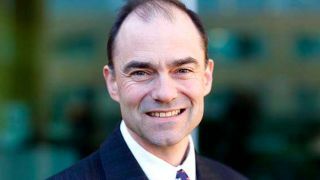 As a company that licenses its IP, ARM has to stay well ahead of the game - and TechRadar enquired as to how the company remains agile in a fast-paced and mercurial market. "It's not really rocket science," he said. "We spend out time not just designing but talking to customers, our customers' customers and people like servic providers about the services they want to offer. "We try lots of tricks and employ some bright people to solve the problems and work around constraints . We can't always make the move all in one go. To go from a to c you sometimes have to go through b. "Take big.LITTLE for instance: we introduced the A9 processor then the A15 and then A7. It's a bit like rock climbing, you don't take all your limbs off the wall at the same time." Since arriving at the company in 1994, East has overseen some big changes at ARM, and he admitted it was a difficult decision to announce his retirement for later this year.